Young Rose dreams of sewing beautiful dresses for the women of Paris. 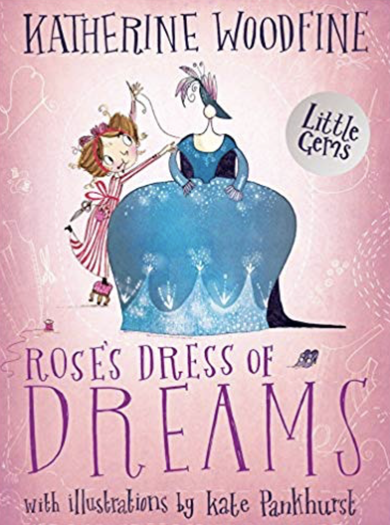 But when a chance encounter with royalty changes her life, Rose must draw on all her skills to create the most breathtaking dress of them all Based on the life of Rose Bertin, the woman credited with creating haute-couture, this is a story to inspire bold girls and boys everywhere. This is a subject - in fact many subjects - close to my heart. Katherine Woodfine shines a light on a woman making waves in history, by making her clients feel good about their clothes. I loved finding out about Marie-Jeanne Rose Bertin, and I loved it that this story was all about imagination, hard work, dedication and, ultimately, friendship. That's a lot to pack into a little book. It would make a great present for a keen fashionista and/or a reluctant reader, and every library should have a copy.